Google Scholar quietly launched a new service, Google Scholar Metrics, earlier this month. Google Scholar Metrics allows users to browse a ranked list of publications in a variety of disciplines, sorted according to their h-indices. Google Scholar envisions that authors will use the service to “consider where to publish their latest article,” and also discover resources outside of their primary field of study. (As interdisciplinary research continues to grow, the latter functionality will likely become increasingly valuable.) Resources are also categorized by language, and journals may also be searched for using non-English terms (e.g. “salud”)—albeit on a limited basis. Since the service launched, I’ve been thinking a lot about what Google Scholar Metrics can do for librarians. The first—and most obvious—possibility is that subject librarians can use it in a way similar to authors, in order to become familiar with new resources outside of their primary area of focus. They also might use it to supplement their calculation of the potential value of new journals (and not to mention that of traditional resources), before making purchasing decisions. Collection development and scholarly communication librarians might be able to use the service to garner support for creating or increasing the budget for their institution’s Open Access publishing fund or institutional repository. Open Access journals, such as those in the PLoS* family, are relatively well-represented in this list. 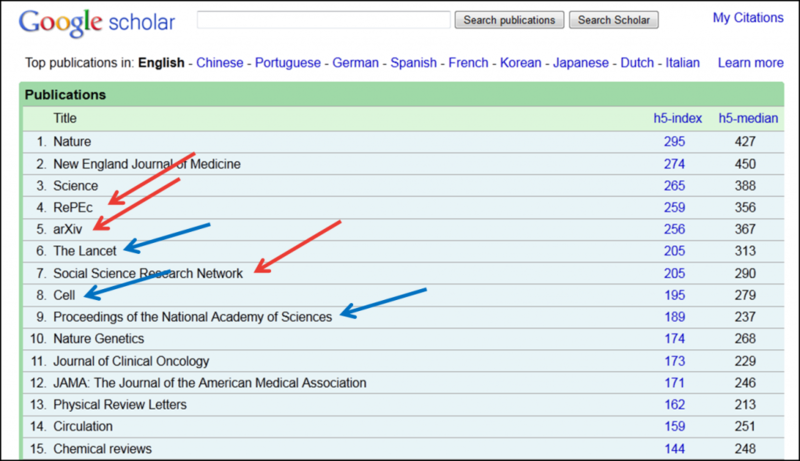 And as you can see in the below screencap (Top English Language Publications), OA repositories (red arrows) rank higher than some traditional heavyweights (blue arrows) such as the Lancet, Cell, and PNAS. What uses do you envision for Google Scholar Metrics in the realm of libraries? * Full disclosure: I was formerly employed by PLoS and continue to be a staunch supporter of this wonderful non-profit. As the Digital Publishing Librarian I am frequently asked what format a researcher should use to publish their materials in our open access institutional repository or in our open access journals. Leaving the other mediums aside for now, I will focus only on text files for this post. The truth is, I spend a lot of time thinking about how to best direct researchers with this question and no great answer seems readily available. My default response is, if you want to use PDF, please use archival PDF/A-1. In my position I recognize how important it is to authors and editors that a document look its best, but I also need to think about how to best preserve it, digitally, for a long time. I’m not a preservationist by a long shot, but these matters still keep me up some nights. We have experimented with a few projects that stray from the PDF. For example, The Medieval Review uses XML to generate their articles which they supply to our repository and in turn we then transform into HTML. We hold on to the XML files primarily because we think they could be useful to our preservation strategy. We’ve also worked with Museum Anthropology Review (see volume 5, issues 1-2) as time and staff help permits to create HTML versions of their PDF articles using a template a crafty student created. While these files in particular are great HTML files, they take quite a bit of time to create as I learned one Friday afternoon last month when the editor and I sat down to try to create them ourselves! Yes, time is a large part of the crux of the problem. Staff expertise as well. I have inquired of these editorial practices and support for the creation of well-formed preservable articles with other library staff doing similar work and our general response boils down to this: we’re a shoe-string shop, trying to get by and do good work without spending a lot of time and money on the format of the output and so we resort to what seems good enough and people like: the PDF. In our spare time, folks like me keep abreast of the the NISO Journal Article Tag Suite – Standardized Markup for Journal Articles. We play around with Annotum, an open-source, open-process, open-access scholarly authoring and publishing platform based on WordPress which allows for the easy creation of XML-based articles. We try to create XML templates in Microsoft Word. If you read into these projects you may notice many of them focus on scientific publications and I thank these developers for venturing into these arenas. Most of the publications I support to date are humanities-based and am hopeful as humanists continue to explore viable options – ones that are easy for authors, editors, and peer reviewers to use and of course, that readers like to read. I look forward to the possibility of discussing these questions at venues such as ThatCamp Publishing 2012. This post is just as much a call for response as it may help point others wondering about these matters to useful resources. I thank people like Michael Fenner at PLoS and Matthew Gold at CUNY for delving into these matters as well. Whenever people think about Scholarly Communication, the first thing that comes to mind is probably not copyright. They might think about the rising cost of journal subscriptions or new publishing methods or even think of putting their work on the web or in an institutional repository. And while these are all valid first thoughts, copyright is generally only thought of after the fact. Copyright should be a lot higher on the list for consideration. Why? Because copyright is the center of the scholarly communication universe! And I’m not just saying that as the intellectual property librarian. Ok, well maybe a little. So, why is copyright so important in the scholarly communication universe? Under US Copyright Law (US Code, Title 17), Section 106 grants authors certain exclusive rights as soon as they put their work into a fixed, tangible medium. Sections 107 through 122 go about setting limitations on those exclusive rights, but for now, let’s just focus on the exclusive rights. These rights include the ability to reproduce the copyrighted work, prepare derivative works, distribute the work, and display or perform the work publicly. An author may share their work publicly on a web page or at a meeting or in any venue on their own as a means of spreading their work. However, many authors want to publish their research or creative activity in a book or a journal in order to share their work. For a publisher to make this work available, they must get permission from the author in order to reproduce (make copies) and distribute (in print or electronically) the author’s work as these are, up to this point, the exclusive rights belonging to the author. This is where publishing agreements and copyright transfer agreements come in. Some publishers have a policy in place that says that by sending them the article you are agreeing to have it published by them. Thus, you are giving them permission. Some publishers require not only permission, but an exclusive transfer of the copyright to them. The transfer is exclusive in that the right was transferred and not retained by the author. Exclusive transfers of copyright must be in writing, so this is why it is important to read the copyright transfer agreement carefully before you sign it. Once an author exclusively transfers these rights, the author no longer has them. This has many implications for the author and should be carefully considered. For example, the author would generally no longer be able to reproduce or distribute their own paper without permission from the copyright owner (who is now the publisher) or by relying on another statute such as fair use. There are arguments why an exclusive transfer is a good thing, and also arguments as to why they are a bad thing. I’m not going there at the moment as this is a blog post and not a dissertation (although this is getting rather long). Let’s suffice to say that ALL publishing requires at a minimum the permission of the original author. This fact alone is why copyright plays such a central role in the way that scholars share their work from the publishing end of things. Copyright plays important roles in other ways that scholars do their work, not just in publishing. Think teaching, research, and other means of scholarly discourse. I’ll be exploring these roles in a series of blog posts the first Monday of the month because copyright is just that important! I hope you’ll join in the discussion.